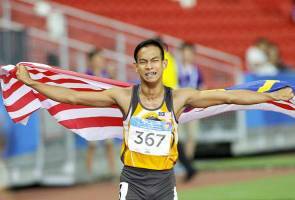 KUALA LUMPUR: National Paralympic athlete, Mohamad Ridzuan Mohamad Puzi won the silver medal in the men's 100m T36 (cerebral palsy) at the 2017 World Para Atletics Championships in London, England on Saturday (Sunday in Malaysia). The 2016 Rio Olympics gold medalist, who emerged victorious at the 2015 World Championships in Doha, Qatar, only managed to win the silver medal by clocking 12.15 seconds to equal his season best timing in the meet held at London Stadium in Queen Elizabeth Olympic Park, said the championships website: www.paralympic.org/london-2017. China's Yang Yifei, who is the 2016 Rio Olympics silver medalist, won the gold after posting a new Asian record of 11.93 seconds while Rodrigo Parreira da Silva of Brazil, who won the bronze medal in Rio, had to settle for the bronze with a time of 12.28 seconds. Mohamad Ridzuan also take part in the men's 200m T36 event at the London meet but he only managed to finish in fourth place on July 17. The results saw Malaysia amassed two gold medals and a silver medal in the meet which will conclude on Sunday (Monday in Malaysia). For the record, Muhammad Ziyad Zolkefli delivered Malaysia's first gold medal after he set a new world record with a threw distance of 17.29 metres in the men's shot put F20 (intellectual disability) before Abdul Latif Romly contributed the second gold with a new championship record of 7.37 metres in the men's long jump T20 (intellectual disability).